The new year is here! I know many people feel gloomy after all the holiday excitement, but I have to say, January is one of my favorite months of the year. It’s quiet and provides a great opportunity for reflection on the past year and setting intentions for what you wish to accomplish in the new year. We have a tradition in our family of writing down our wishes for the new year on pieces of paper and then burning them in the fire on New Year’s Eve to release them into the universe. I am a big advocate of setting goals for both your professional and personal life. However, there is a lot of research on how difficult it is for people to actually stick to their goals and see them through to completion, which is understandable. 12 months is a long time, and things change so quickly throughout the year. It’s easy to forget what you initially set out to achieve. I like to think of an overarching theme for the year, such as ‘improve my career situation’ or ‘focus on learning.’ My main theme last year was on physical health. I have a few chronic health issues I have been battling for years, and I wanted to ensure I was eating properly, taking the right supplements, and implementing an exercise routine that worked for me. I wrote down three to five specific goals relating to my primary goal but just focusing on one main theme prevents that overwhelming feeling of having too many specific aspirations and really helped me carry out my goals through to December. Many important aspects of your life need to be balanced in order to achieve overall optimal health, including physical health, emotional health, spiritual health, relationships, home, career, family, etc. When one of these aspects is off-balance, it throws off your entire being. Last year I was very focused on my career and building my business, but I knew I would not be as effective unless I felt good physically. If focusing on obtaining a new and fulfilling career is at the top of your goals list this year, first check to make sure all your other needs are being met. 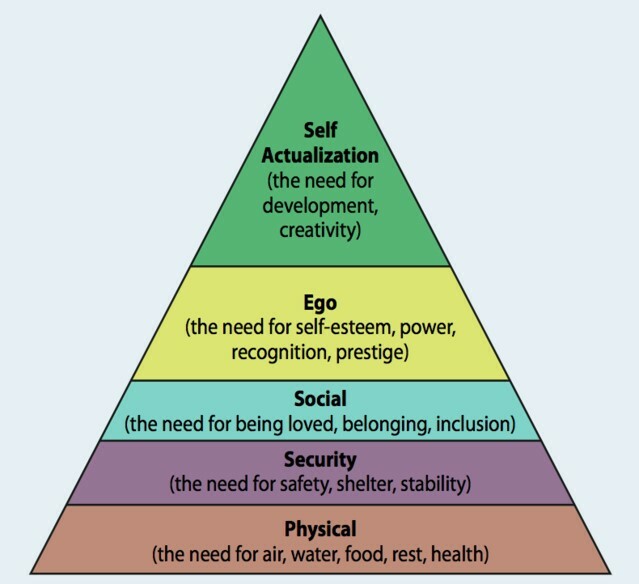 Abraham Maslow developed a “hierarchy of needs” theory on human motivation, which can be illustrated in the image below. The theory states that humans are not able to achieve the supreme stage in life, self-actualization (the need for growth, development, purpose, meaning) until the all other needs have been met. For example, if you are seeking a new, meaningful career but are lacking in social connection, then you are less likely to reach self-actualization until you fulfill your personal social needs. Are you feeling stuck trying to set realistic and achievable career goals this year? Give me a call! I can help you determine a direction and create an action plan that’s right for you to reach ultimate balance and harmony. Make 2019 the year you reach for the stars and capture the moon!